New research finds that Oumuamua, the rocky object identified as the first confirmed interstellar asteroid, very likely came from a binary star system. “It’s remarkable that we’ve now seen for the first time a physical object from outside our solar system,” says lead author Dr. Alan Jackson, a postdoc at the Centre for Planetary Sciences at the University of Toronto Scarborough in Ontario, Canada. They found that rocky objects like Oumuamua are far more likely to come from binary than single star systems. They were also able to determine that rocky objects are ejected from binary systems in comparable numbers to icy objects. 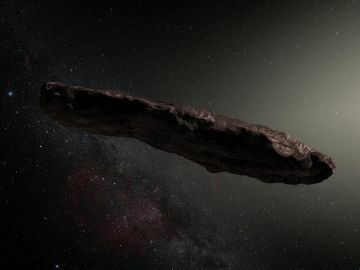 Once they determined that binary systems are very efficient at ejecting rocky objects, and that a sufficient number of them exist, they were satisfied that Oumuamua very likely came from a binary system. They also concluded that it probably came from a system with a relatively hot, high-mass star since such a system would have a greater number of rocky objects closer in. The team suggests that the asteroid was very likely to have been ejected from its binary system sometime during the formation of planets. Oumuamua, which is Hawaiian for ‘scout,’ was first spotted by the Haleakala Observatory in Hawaii on 19 October 2017. With a radius of 200 meters and traveling at a blistering speed of 30 kilometers per second, at its closest it was about 33,000,000 km from Earth. Researchers were also fairly sure it was from outside our solar system, based on its trajectory and speed. An eccentricity of 1.2—which classifies its path as an open-ended hyperbolic orbit—and such a high speed meant it was not bound by the gravity of the Sun. In fact, as Jackson points out, Oumuamua’s orbit has the highest eccentricity ever observed in an object passing through our solar system. Major questions about Oumuamua remain. For planetary scientists like Jackson, being able to observe objects like these may yield important clues about how planet formation works in other star systems.